The KELITE Cast Trunnion Mounted Ball Valve’s split body construction complies with API 6D, ASME B16.34, API 608, API 607 and other relevant ASTM specifications. 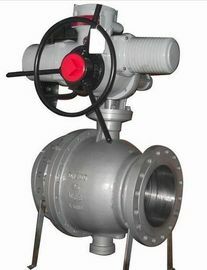 With a variety of material selections available as well as ISO 5211 complaint direct mount actuator pad, the Cast Trunnion Ball Valve can be customized and automated to suit a complete range of oil and gas applications. resulting in tighter sealing. The self-relieving seat, a standard design feature, prevents excessive pressure buildup within the valve by automatically relieving when body cavity pressure exceeds the spring and line seat pressure.